Jyothsna Giri, MD, MBA is an Education Specialist who supports creation and implementation of pharmacogenomic education for providers and pharmacists. She represents the education team on several Mayo Clinic PGx committees including the enterprise wide Pharmacogenomic Task Force. Her interest in pharmacogenomics has led her to pursue a fellowship in Clinical Pharmacology alongside her role in education. 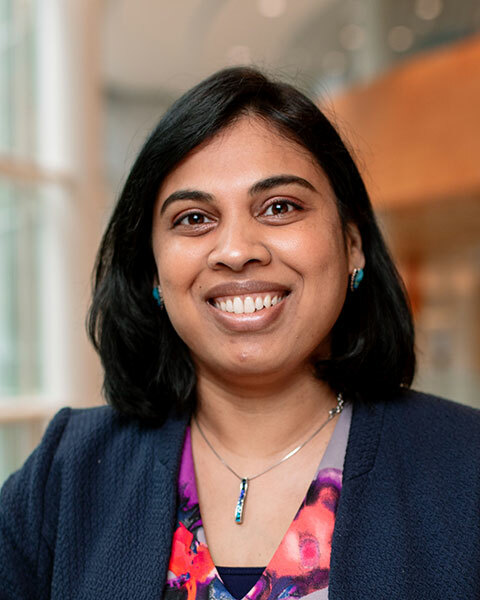 Bio: Jyothsna Giri, MD, MBA is an Education Specialist who supports creation and implementation of pharmacogenomic education for providers and pharmacists. She represents the education team on several Mayo Clinic PGx committees including the enterprise wide Pharmacogenomic Task Force. Her interest in pharmacogenomics has led her to pursue a fellowship in Clinical Pharmacology alongside her role in education.